7.9" x 5.7" stitched on 14 count. 6.1" x 4.4" stitched on 18 count. 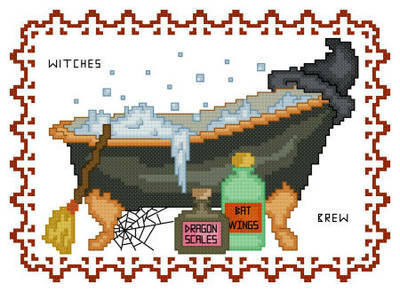 Bath Tub Collection Witches Brew cross stitch pattern... This collection is the perfect whimsical addition to any bathroom. In this design a black bathtub is adorned with witches accessories like hat, broom and brew ingredients. Collect the whole series.